One of our favorite places to visit is Mountsberg Conservation Area in Campbellville, Ontario. We discovered it a few years back after picking up a brochure at our local bird store. We visited this special place last Saturday for the first time in about a year and were surprised and thrilled with all the work that they've done and are still doing, to make it an even more enjoyable place to come for the day. The large grounds host many picnic tables, and the new visitor centre has washrooms and a gift shop. There are many walking trails and they host many activities and special events through-out the year. As we were driving up to the parking lot we happened to notice a Painted Turtle out on a log in the pond by the driveway, so after parking the car we walked back to the pond to take a closer look. We were also treated to a sighting of a Green Heron, also at the pond. It was the first time we had seen one of these beautiful creatures. A Northern Water-snake was also coiled around one the bushes over the pond. All this, and we hadn't been out of the car for ten minutes! 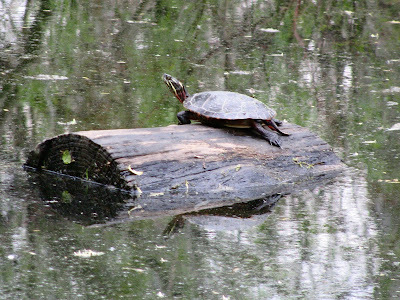 A Painted Turtle sunning himself in the pond. The main reason we had decided to visit Mountsberg for the day was to see if the Tree Swallows had returned for the summer, they had! The "Swalloville" nest boxes, all will be filled with Tree Swallows. Welcome to Swallowville, where the Tree Swallows return every year. 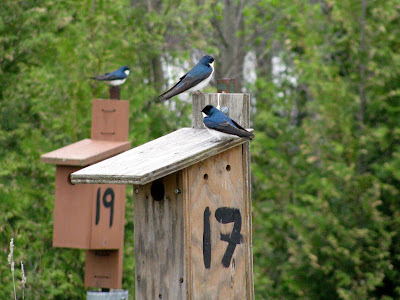 A pair of Tree Swallows claim a nest-box for the summer to have and raise a family. The barn at Mountsberg is always a busy spot. It houses the many barn-yard animals, including; horses, goats, sheep, rabbits, roosters, hens and Barn Swallows for the summer. 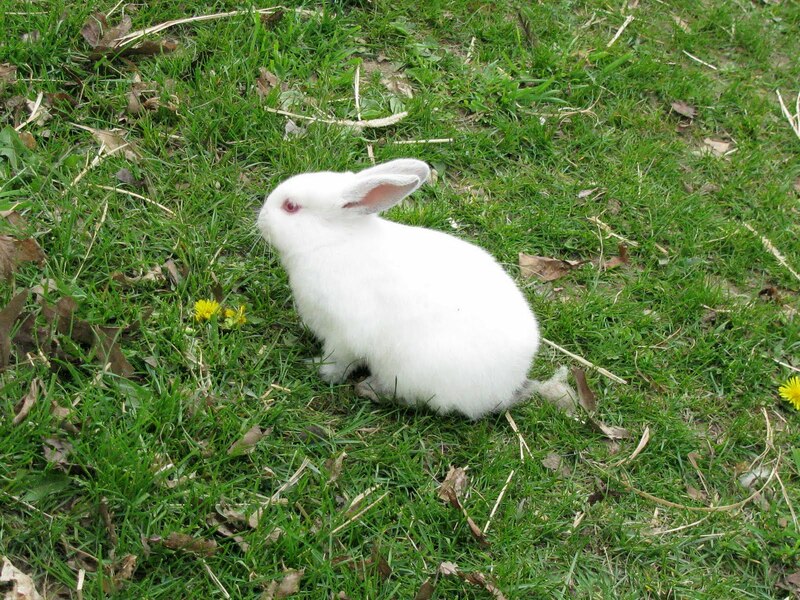 A pair of bunnies, one of many hopping around the bard-yard and grounds. 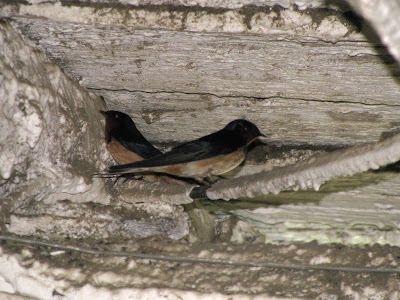 A pair of Barn Swallows who will build a nest and raise their family in the barn. 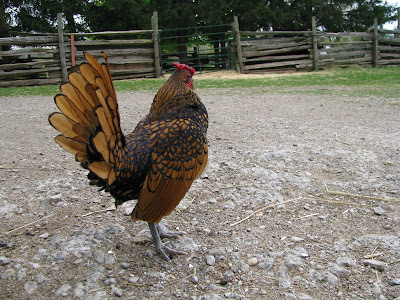 One of the many pretty roosters and hens walking around the barn-yard. 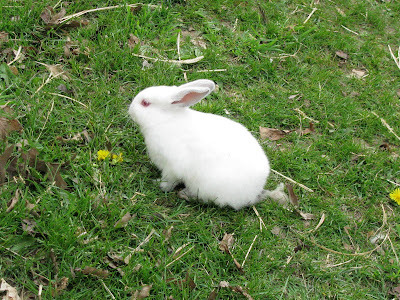 A baby bunny, one of the many hopping around the barn-yard. A pair of baby lambs in the very busy barn-yard. 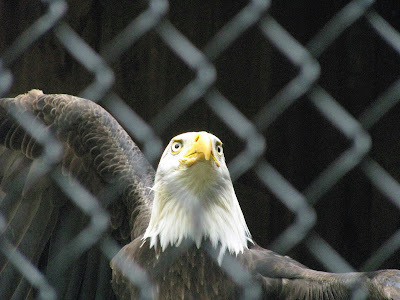 One of the things that makes Mountsberg Conservation Area truly special is the Raptor Centre, where many different species of raptors, including Owls, Hawks and Eagles are housed. 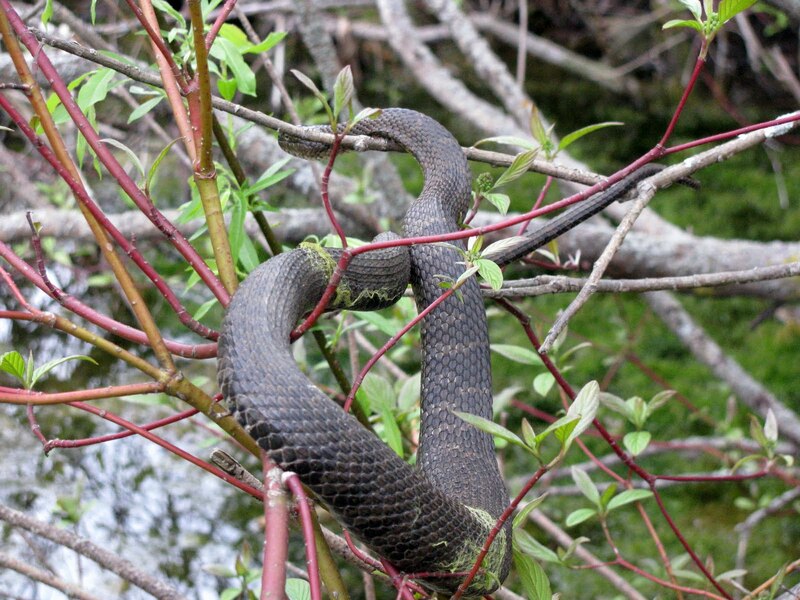 They are non-releasable due to injuries they have sustained, and are unable to survive in the wild. Mountsberg provides a permanent home for these birds. 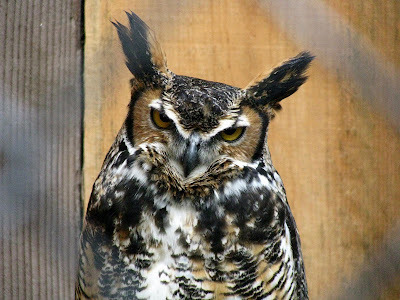 On the weekend they have shows to show case the birds and you can learn a lot about them and get an up close look. If you don't make a show, you can follow the "Wildlife Walkway" and see them that way. You can also "adopt" one of the raptors for the year and receive an annual pass to the park and know that your dollars are going for the care and upkeep of the birds and the centre. 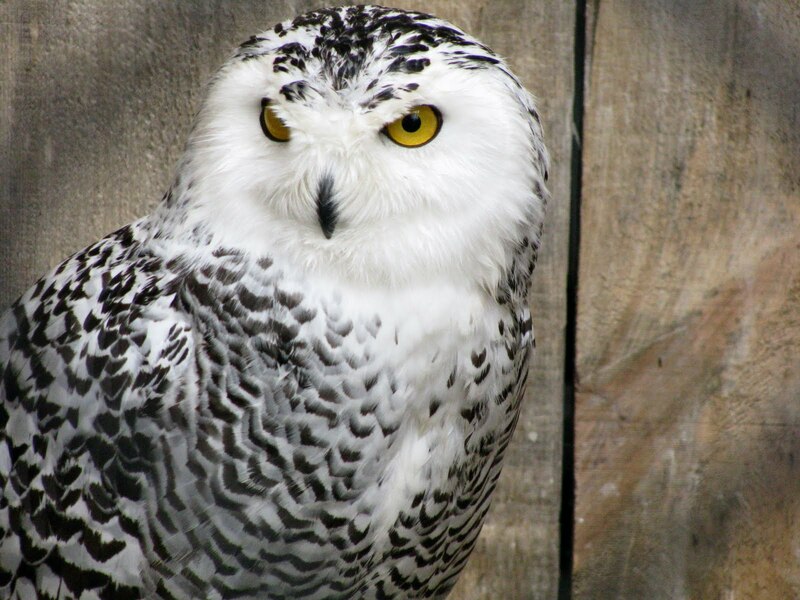 Rob and I plan on "adopting" Quincy, a Snowy Owl, when we return later this month for a bird banding program. Mountsberg Conservation Area is a beautiful and wonderful place for any nature nut to spend an enjoyable day. I know Rob and I are already looking forward to our next visit to this truly special place. A Bald Eagle at Mountsberg. A Female Snowy Owl at Mountsberg. I gotta go there! Bunnies!!!! It's been a couple years since I've been there ... I'll have to put it on our list of things to do this summer. You've done a great job of representing the natural beauty of the park! 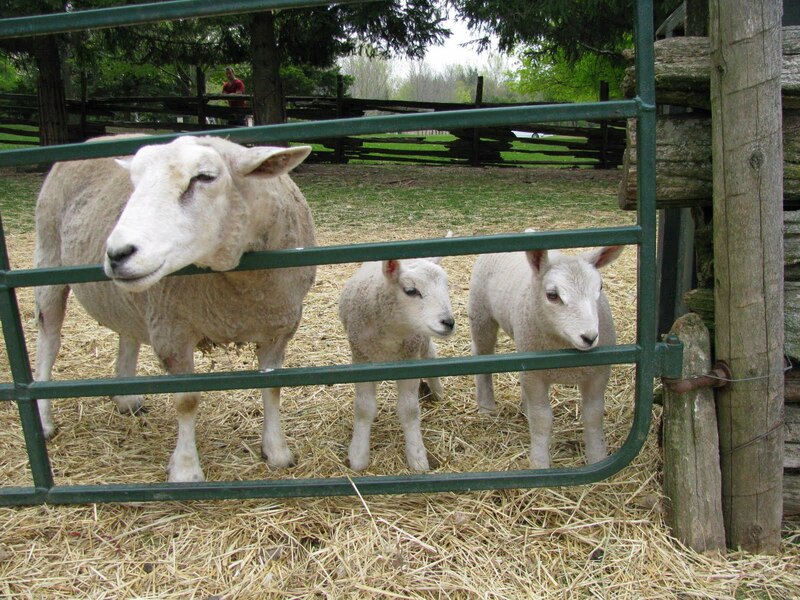 Your pictures capture exactly why Mountsberg is a sweet place to visit and have fun! Thanks!